I’m fascinated by sub-cultures: the ways that a group of people bond, and how they present themselves to the world. The first sub-culture I became aware of was in 1976. Chocolate brown skivvies were all the rage but the shop wasn’t well lit and mum brought me home a black version. Everyone knew you couldn’t wear black: only Rockers wore black and I was sure to get beaten up for crossing the code. In my sheltered Perth world there were only two sub-cultures: Mods and Rockers. They hated each other and the rest of us tried to keep out of the way of the carnage that resulted when they met. Think Quadrophenia. I didn’t know any Rockers of course, and never did so I can’t be sure it was true. In 1979 I moved to Scarborough High School, close to Scarborough Beach where the legendary Snake Pit was home to Bodgies and Widgies. Or rather, it had been in the ’50s. In the ’70s it was all about Surfs and the Snake Pit was a smelly old cafe with pinball machines in the dark backroom. Soon it would be gone, demolished as the strip became upmarket and the beach ruined by a Gold Coast style tower. I’ve never met a Bodgie or a Widgie but Surfs were so commonplace in Scarborough, I hesitate to call them a sub-culture but Puberty Blues (the original book) was the story of my early teens. Tradition dictated you’d lose your virginity in the back of a panel van in a beach car park. I was very unhappy: it wasn’t my scene. I couldn’t even manage a decent tan despite the daily beach visits. I read that book until the pages all fell out and then I sticky taped them back in. If you’re reading this via email, click here to see the clip. What a dance! I love that this group had their own unique style. Australia generally follows the Northern hemisphere in most things but here was something uniquely our own. It’s an easy to learn dance with plenty of scope for different tempos or levels of enthusiasm. It can be both flirtatious for women and aggressive for men. It’s also rather comical. If you want to see more, just ask youtube for “Sharpie dancing”. There are some great examples. The Sharpies started off in the ’60s, influenced by English Mods and created by post-War migrants who would bring out European fashions when they arrived in Australia. They had a taste for Italian style, especially in tailoring and knitwear, hence their name: Sharpie came from “sharp” dressers. Sharpies 1972 – from “Top Fellas” by Tadqh Taylor. Very Mod. As fashions changed through the ’60s, so did they, and by the time they reach the era of their fame, the ’70s, there was a uniform: fine knit jumpers and cardigans with stripes plus high waisted tight jeans or pinstripe trousers. Sometimes very wide legged and long, covering their clomping big boots or shoes: platforms or clogs. The girls (known as “Brushes”) wore jeans, denim mini skirts or pinafores with the highest chunky shoes they could: often with cork bases. Or “treads”, shoes with a sole made of old tyres. The distinctive fashion item was the striped knitwear called the “Connie”, originally the “Conti” as they were made by Thornbury tailor Mr Conti. Here you could either choose one from the shelf or custom made to the colours and stripes of your choice. They didn’t come cheap – almost a week’s wages for a teenager – but they were very prized. At Circa, I’m often asked for Connies but sadly, I’ve never seen one to buy. They seem to be kept (hopefully well protected) by their original owners, who still value them. Either that, or perhaps they were worn to shreds, or shrank a little too much in a too hot wash. If I do find one, it will go into the private collection for use in talks etc – the Sharpies are becoming an affectionate part of Australian social history. The Sharpie style is very similar to the current fashions of the time, incorporating elements of Glam Rock and roller skating culture, but with a harder edge. The ’70s was a very body conscious decade, and they wore the clothes small and tight. The Connies were worn especially small and tight, resembling midriff tops at times, with three quarter length sleeves. The hairstyles were reminiscent of Aladdin Sane and Ziggy Stardust, although when others grew their hair long the Sharpies kept it short. Music was important to the Sharpies and back then when you couldn’t get band t-shirts, they’d get their favourite artist’s name made up in flocked velvet letters on a t-shirt. Bowie and Slade were favourites (soon to become B wie and Sl de when the letters peeled off in the wash). They loved Aussie rock with Lobby Lloyd and Billy Thorpe amongst their favourites. The t-shirts also declared the name of their gang based on their suburb or even their street. They congregated in large groups, often at gigs or train stations and were very violent, often scrapping with rival gangs. Apparently even the police were scared of them. Photo source: “Skins n Sharps” Love the lumber jacket in the front: for when the Connie wasn’t warm enough. 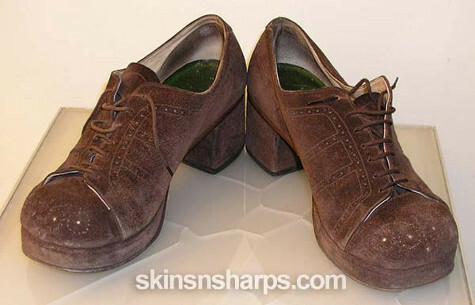 Sharpies have been compared a lot with skinheads and there seems to have been a certain degree of overlap – the best site for Sharpie information is “Skins n Sharps” but for me, there was always a difference. Although I didn’t know any Sharpies, many of my friends dressed similarly and some of the girls even danced in that idiosyncratic way – I’ve never seen a man dance like that though. A pity. Sharpies seemed to vanish in about ’79 just when punks, mods and skinheads were taking over – those were the groups I knew. The skins were very violent and we all knew to keep away from them in groups. I was once chased through the dark streets of North Perth by a skinhead with a knife after I looked at him the “wrong” way in 1984. 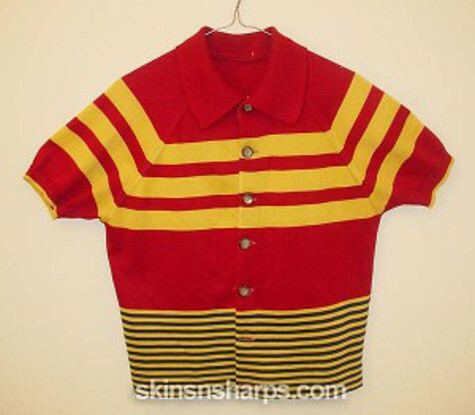 Striped woolen jumper by the House of Merivale, mid ’70s. The same colours have been used used in this House of Merivale jumper. I love how the stripes only go around the front. Im absolutely fascinated by the Sharps, ever since Julie from my old work gave me a copy of the book she wrote, RAGE. Not having grown up here, the sub-culture was completely new to me and revealed a whole section of Melbournian history that is so unique. What a wonderful read after a long day at work. Thank you for the marvellous Sharpie education. I particularly love the impact of migrants and local fashion-producers on youth culture. Fabbo. Kids would dress in sharpie clothes – connies (blue and brown), treads and lumber jackets at my high school, but there was only one full on Sharpie (with haircut) I remember from my year, who is now a semi-respecatable Mum 🙂 There was co-mingling with other 70s fashions too, like Hawaiian surf shirts and Miller lurex plaid shirts, and even the Sharpie girl had surfie beads. That clip is fantastic! I loved that the dancers were “dancing like no-one was watching” and looked like they were having the most fun! I have seen the dance demonstrated in real life by a couple that we met through our local footy club, now very respectable middle class (and middle aged!) parents. I love that video! I grew up in NZ around that time and Eagle Rock was huge but I’ve never seen the vid before. The dance doesn’t look unfamiliar though. We had similar clothes but I’ve never heard of sharpies or connies either. It’s interesting I had never heard of the sharpies. The Mod style was very simplistic I loved that style when it was out. Thank you for Sharing. I stumbled across your site when looking up references to the Sharpies of the 1960s in Sydney. I just wanted to alert you to the fact that the Sydney Sharpies were not only of migrant descent. A distinct, and totally separate subculture of Sharpies developed amongst Anglo Saxon working class teenagers, focussed on fashion, music and a unique language style. The boys had their trousers custom made at Zinks in Darlinghurst and Syd Green’s in Glebe. For more details you should read a book by Kim Hewett- Out With The Boys: the Sharpie Days. Aside from being a fascinating and well-written book, it documents, in detail, the clothing styles of the Sydney Sharpies of the time. Few if any photos exist of the 1960s Sydney Sharpies as unlike the Sharpies in Melbourne in the 1970s, these earlier Sharpies were usually too poor to own cameras, and record their lifestyle and fashions visually. Thanks Lisa, sounds like a great book! I’ll see if I can find a copy. You are right the Original Sharpies started in 1963 but you are wrong about who we were influenced by it was not by the English Mods or any one else we the Original Sharpies created our own look. We called our self depending which suburb you came from Richmond Boys, Collingwood Boys, ect others called us Sharpies because we dressed “sharp”. Thanks for your input David: they sound like great days! I’m an ex 1970s Sydney Leichhardt Sharpie you can find my Sydney Sharpie page on Facebook you will get to see what the fashion was in our Sharpie era among other Interesting stories . I agree with David Gay who as the 60s Melbourne Sharpies page on Facebook and there also a 70s Melbourne Sharpie page on Facebook as well. Thanks George – great to hear about the Sydney Sharpies too. I’ve been making replica Conny’s as they are very hard to find. I have a few left of the west side sharp design & currently working on a new one. I also collect Australian vintage fashion & love the sharpie clothing. Hi for the life of me I cant remember what the hoodie was named back then. I know it was common for sharpies to wear them. They had hoods and pockets. Would you remember? Grew up in Melbournes Western suburbs. In the 70s (i was 15 in 73) we called hoodies track suit tops. With or without hoods. Never ever put the hood on though as it would ruin the spikey “Rod Stewart” style hair. Shopping was something we did on Saturday in the city. Usually it was The In Shoppe, Merivale, Melbourne Surf Shop or Surf Dive n Ski for my many treads, Myer of course and Mr Figgins shoe shop in Swanston St later in the decade as my income increased. Thanks for your comment Sharyn: loved those Rod Stewart hairstyles! I’m a little younger and found you all so intimidating, especially the ones with Bowie Aladdin Sane/Carol Brady hairstyles. I couldn’t go shopping for jeans because of all the groovy, older teenagers. I cherish those memories now and wish I had been a little older to have better style icons than the ones I had in the late ’70s. I have a Conte (Connie) for sale but wouldn’t know what the price would be … would love to know what they’re worth. It’s one the stock ones he made – Light/Dark Brown … and it still has the label on it and is in near perfect condition !! Thanks for your comment John: your perspective is clearer than mine on this as I was younger, and not in with the crowd. Great article Nicole. My cousin Dave and I went to Op Pop Disco downstairs in Castlereagh Street in 1967/68 and I have a problem finding photos of the Sydney sharpies of the late 60’s. Like the Melbourne sharpies of the seventies we wore jumpers (usually Crestknit) that had three stripes across the chest – one thin either side of a thicker stripe. They were usually blue or maroon with white stripes and were worn by both males and females. 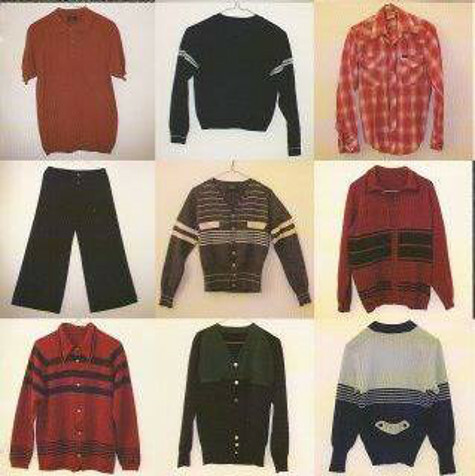 We used to wear them with either blue jeans (Levis or Lee) or high waisted buttoned and back buckled tight trousers. Someone must have a photograph somewhere. Cheers John. Thanks for your comment, John and great visual! I can see the late ’60s Sharpies so well. John, if you’re in Melbourne, Sharpies are featured in a current exhibition at the Royal Historical Society. Details here. Thanks to your comment, I’ve just discovered that there’s a curator talk on tomorrow. 70’s. Does anyone know what these black suede school shoes were called?